What Would Jesus Be Packing? First I read that churches in Kentucky are using gun giveaways to help people find Jesus. Then, in a front-page story in my area, the pastor of a local Baptist church plans to give away an AR-15 assault rifle to the winner of a free raffle at an upcoming Sunday service. We have decided to hold a special service honouring hunters and gun owners who have been so viciously attacked by the antichristian socialist media and antichristian socialist politicians the last few years. Our country was built with the King James Bible and the gun. My theology is very different from this, and I struggled to understand. Part of the issue has to do with the notion of “a long standing and deep sense of a special and unique American Destiny, the belief that… America is a nation called to a special destiny by God.” This thought process fueled Manifest Destiny in the 19th Century, for instance. The interpretation of the verses can follow either a strictly physical direction in which swords must be used, or a nonphysical one in which swords must not be used, during Jesus’ last hours… first we analyze why the literal one will not fit into Luke 22:34-38 and into the passage about the arrest in the Garden of Gethsemane (Luke 22:39-53). Jesus says to the disciples to buy swords, but when they show him two, Jesus says the two are enough. The literal [direction] is inadequate for two reasons. First, the obvious question is: two swords are enough for what? Are they enough for a physical fight to resist arrest? This is hardly the case because during Jesus’ arrest… Jesus sternly tells Peter to put away his sword, “No more of this!” and then he heals the servant, restoring his ear (Luke 22:49-51). Resisting arrest cannot be the purpose of the two swords. Second, were the two swords enough for an armed rebellion to resist the authorities and to impose the new Jesus movement in a political and military way? Jesus denounces this purpose in Luke 22:52, as the authorities are in the process of arresting him: “Am I leading a rebellion that you have come with swords and clubs?” The answer is no, as he is seized and led away (v. 54). Second, “For I tell you, this scripture must be fulfilled in me: ‘And he was numbered among the lawless'” (Luke 22:37). By far the clearest purpose of the two swords is Jesus’ reference to Isaiah’s prophecy (53:12). He was destined to be arrested like a criminal, put on trial like a criminal, and even crucified like a criminal (but his arrest, trial, and execution were based on false evidence. He did nothing but good.) Yet, he was hung on the cross between two thieves, which is also a fulfillment of Isaiah’s prophecy (Luke 23:32; 39-43). What are criminals known for carrying with them? 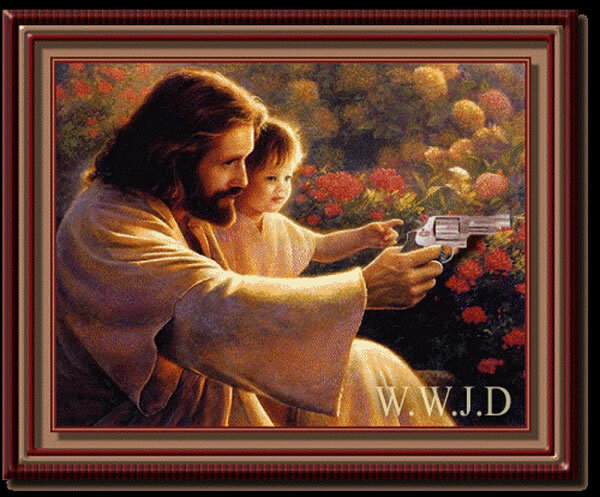 Weapons, and to be numbered among criminals, Jesus must also have weapons. That is why he said that only two swords would be enough—to fulfill this prophecy. The argument that Jesus was fulfilling Scripture, and/or that two swords would not be sufficient if meant literally for defense, was noted HERE and HERE and especially on the Wikipedia page. The “armor of God”, in my belief system, does not require OUR literal weaponry. Not sure how the swords fulfill Isaiah 53:9-12. I also don’t like the “try to look guilty” argument; I can’t imagine a deceitful Jesus. Personally, I think it’s a bit more mundane. He knew he would be leaving his disciples shortly. He’d given them a little taste of Heaven, but now they were going back in 1rst century Roman occupied Judea. There were no police, the courts were not concerned with the problems of the poor, and roads were dangerous. If the disciples didn’t carry a sword, they’d look too vulnerable to thieves, cutthroats and general crazy people. Well, I’m not all sold on the “appearing criminal” stuff. Maybe it’s to have them to NOT use them. But I’ve been trying to have a discussion on Alan Rudnick’s blog post. This guy said that Jesus chastised Peter’s USE of the sword because he cut the wrong guy. I’ve given up THAT debate. I’ve never been that hung up on “fulfillment of Scripture” from OT sources. This is the sort of debate that reinforces my anti-religious perspective. There is a difference between spiritual awareness and religious dogma; religion tries to encode the spirit, but always does so with the cultural prejudices of the local tribes and historical times, presenting them as universal and eternal beliefs. The Abrahamics, particularly in the Torah and Qur’an, laud the slaughter of Other Believers by those obedient to the “TRUE” Deity. They take it upon themselves to be “His” Enforcers. Just as American Christians supported slavery, which the Abrahamic scriptures all encode. Just as they sing to their Deity while “marching off to war.” Ther is not a whiff of democracy, it’s all monarchism and priesthoods. The excuse that they aren’t “real” Christians grows thin after sects have been slaughtering each other for centuries. I thank God that I’m an atheist. Well, now I know exactly what to say when someone quotes Luke 22:36 as a justification for gun violence. “Two is enough for everybody” and “Put them away, don’t use them.” Orders from Jesus. Yeah… I stay away from TU now. It’s like a troll magnet. I like the idea of “having weapons but not using them.” Gandhi said: “It is better to be violent, if there is violence in our hearts, than to put on the cloak of nonviolence to cover impotence.” Maybe it’s that spirit; it’s intended to be more complex. Wow, Roger, you opened a can with this one! Remember, Jesus also said he came “not to bring peace, but with a sword.” For me, these are metaphors. Remember, the “sword” would separate believers from non-believers, not that one was right and one was wrong – but to reinforce that following Jesus was a hard road and people’s families would vehemently argue that their youth should stay home and help their family. I’m the pastor’s wife who TOTALLY gets that folks are disenchanted with religion, especially the OT and NT. Jesus’ message fits well with Gandhi: Peace, love, nonviolence. I don’t believe the sword you mention was to fulfill Scripture, but that’s just me. All roads walked in love give the walkers something in common. That means I respect all faiths, agnostics (like my Riley), atheists. The only people I have a hard time accepting are those who use the Bible as a battering ram. They are not following the gentle path. Amy – dont mind “opening one” if it’ll lead to productive discussion. I’m uncertain about the fulfillmrent part, but your assessment about not to bring peace I agree IS a metaphor. I believe the bible’s message with some of these passages is that violence breeds more violence, and while it doesn’t address gun control, it does supports the idea of self defense. Our founding fathers believed “the ultimate goal of the Second Amendment is to make sure you can defend yourself against any kind of illegal force that comes against you, whether that is from a neighbor, whether that is from an outsider or whether that is from your own government.” I would agree. But I was a bit taken back by the reasons behind this pastor’s justification of a free giveaway of the rifle.